This latest chair from Peter Donders exemplifies his skill as both a designer and a technician. The 3D bronze cast has one continuous surface and a brilliant finish. Also available in aluminum. Contact us to find out more. The "IMAGINE Peace Now" exhibition opens November 2016 with 100+ works of compelling, peace-themed artworks made from decommissioned firearms. Organized by Outdoorz Gallery artist Boris Bally, the exhibition is an attempt by artists to call an end to gun violence, an action we wholeheartedly support. The exhibition opens this November at the Wellington B. Gray Gallery at East Carolina University, Greenville, North Carolina and travels to Boston's Society of Arts & Crafts in early 2017. The artists are currently running a kickstarter campaign to fund the comprehensive catalogue. Your support is welcome ! "Stretching Time into Infinity" is how Rado, Switzerland marks the pairing of its exceptionally crafted watches with the exceptionally crafted limited edition C Bench by Peter Donders. Find out more about C Bench here. Lilliana Ovale and Colectivo 1050° "Open Fires"
Enrique Kahle from Dvelas design is among 10 young spanish designers presenting their work at the Today Art Museum in Beijing from August 16- 31. Building 4, Pingod Community, No.32 Baiziwan Road, Chaoyang District, Beijing. Kahle's work features recycled sailcloth worked into contemporary forms. Make Yourself Comfortable at Chatsworth will see items from the private collection of the Duke and Duchess showcased alongside furniture by internationally acclaimed and innovative designers – from Thomas Heatherwick and Amanda Levete, to Marc Newson, Tokujin Yoshioka, Piet Hein Eek and Moritz Waldemeyer, Deger Cengiz, Liliana Ovalle, and Nobody&Co. The exhibition will also showcase thought-provoking, specially commissioned pieces, including Raw Edges’ End Grain seating which will become part of the Sculpture Gallery, and Synthesis IV by emerging designer Tom Price which will be on display in the Chapel. The Ti-Join chair by Peter Donders will be showcased at an exhibition entitled "Making a Difference / A Difference in Making at the Bozar Center, April 24 - June 7, 2015. Decades after its invention, by now it is clear that 3D Printing is a manufacturing technology that can change and revolutionize the way we can make almost anything. Experts estimate that it will be a key technology in this century, enabling industrial developments that were impossible before. In fact, many products in our daily life are already prototyped or manufactured using 3D Printing. Given its expected future role, it is critical to examine how it can affect our environment, shape our society and change individual lives. Curator Marta Malé-Alemany and Materialise come together to present MAKING A DIFFERENCE / A DIFFERENCE IN MAKING, an exhibition that looks at 3D Printing with both the eyes of fascination -inviting viewers to discover a production process that allows us to make things differently- and through a deeper observation, to ponder how it can help individuals, enable social changes and positively contribute to the environment. In other words, how 3D Printing is making a difference. If you are in Brussels be sure to check it out. Outdoor Designer Liliana Ovale's works entitled "Sink Holes" (pictured) is part of the exhibition entitled "New Territories" at the MAD till April 5. The term “new territories,” as evoked by Italian architect and designer Gaetano Pesce, refers to the state of making in today’s globalized society, a phenomenon that has helped to spur a confluence of art, design and craft. The exhibition New Territories: Laboratories for Design, Craft and Art in Latin America examines this trend in several distinct cities throughout Latin America, where some of the most pertinent new directions in arts and design are emerging today. If you are in NY, be sure to visit MAD at 2 Columbus Circle. If you miss the exhibition you may still have the opportunity to see Liliana's work which has just been added to the permanent collection. Or check the collection here at Outdoorz for Liliana's Crash Bench. 'Synthesis' is the study of a dialogue between two contrasting materials - resin and tar - and their negotiation for space and identity when forced to become a single unified entity. Synthesis 1,2 & 3 were created for the exhibition, ‘Presence and Absence: New Works by Tom Price’ currently on show at The Nelson-Atkins Museum of Art in Kansas City (until 4 January 2015). Each of the works in the exhibition responds in different ways to the notion of presence and absence, exploring materials as diverse as resin, bronze, aluminium, coal and tar. Tom continues to stretch the boundaries between art and design. See more of Tom's work here. Sponsored by Beleza Design & Art, a Brussels-based institution created by design and art lovers to promote the development and internationalization of artists and designers through exhibitions, conferences, publications, participation to art and design fairs and consultancy. Peter Donder's amazing C Bench was one of the features of this exhibition. Up next, Miami…stay tuned. Within the Sustainable Architecture and Science Week in Madrid will be held Madrid Recycle, an event dedicated to art and sustainability with seminars, activities and roundtable discussions. Designers of the up cycled Trimmer sail cloth chair will be participating and presenting a talk, Tuesday, November 4, 12:40 am at the Hall of the Technical School of Architecture at the Polytechnic University of Madrid. If you are in Madrid be sure to stop by. The stunning Chatsworth Estate in Derbyshire England will be hosting a special exhibition in March of 2015 entitled "Make Yourself Comfortable". 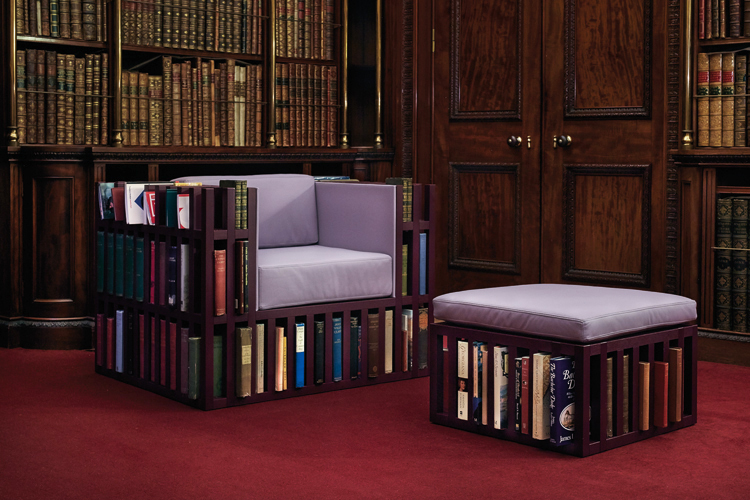 Bibliochaise by Nobody&co, Chaiselawn by Deger Cengiz and Fragment of a Staircase by Lilianna Ovale have all been selected. We are excited that Outdoorz Gallery will be participating in this exciting event. More details in the months to come.